The Christian church, from its beginning, has baptised people to mark their admission into membership of the worldwide Christian community. Baptism by water is a sign used by the Church to point to the love of God for all creation. It is a visible act, instituted by Jesus Christ, in which a person is celebrated as a beloved child of God. In baptism, we welcome people into the family of faith and we acknowledge God’s gifts of life and love. 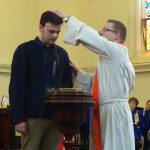 As one of the sacraments of the Uniting Church, we baptise both adults and children as recognition of God’s love for us from birth. Baptism takes place as a part of our regular Sunday morning service at 10:00 am, usually on the second Sunday of each month. People wishing to schedule a baptism will also need to meet with one of the ministers at Brougham Place. In the case of Infant Baptism, it is best if both parents can attend. There is no charge for having a baptism at the church. Everyone is welcome to be baptised at Brougham Place. Please contact the church office to schedule a baptism.